“Here are two videos of mine with DN content. One is of Rich Crucet light air practicing on his home ice, Lake Ronkonkoma. Another is of Rich and I sailing on our other favorite lake, Bantam in CT. This is the last sailing video of Rich prior to his passing. Rich was the most influential force in the Lake Ronkonkoma Ice Yacht Club for many years. 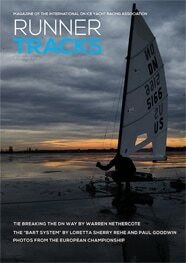 He was a Long Island iceboat builder, teacher, instructor and friend to all classes of iceboat sailors. Rich pushed us all to build or repair our boats in the summer, make roof racks and trailers ready and get our selves ready to travel.